Mirror backup software provides identity of contents of two locations by comparing and synchronizing them. Unlike one-way approaches, where you need to distinguish source and destination, mirroring works in two ways. To perform mirror backup, you need to use specialized software, such as Handy Backup. The synchronization function of our software can work in many ways: choosing direction lets you copy files from the first location to the second, from the second to the first, or mirror-back-up HDDs or folders. To get use of the mirror backup software functionality, you need to select two storage locations. You can mirror data stored on any drives - local, external or network , including USB, LAN, FTP, SFTP, and FTPS. You can mirror contents of two HDDs, simply by selecting root drive letter as a folder for synchronization, or perform complete hard drive cloning through the use of the disk image feature. To perform mirror backup (two-way synchronization), you need the Standard edition. If you want to perform image-based backup (on sector level), please check out the Professional edition. Free 30-days trial version! Mirror backup is performed through the Synchronization function which exploits a files-based data transferring method. Files-based transferring means that the program can copy only the data that is represented in the file system as usual files and folders. This limitation means that the feature cant be used for hard drive cloning. However, creation of disk image can be done through the use of image backup which is a different function. Filtered Backup. You can specify file masks and back up files of selected types only, e.g. pictures or MS Word documents. Scheduling. 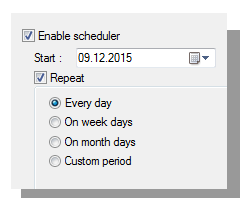 There is an easy-to-use scheduler which allows you to perform backup daily, weekly, monthly, or in your own period of time. Regularly using mirror backup software is a good way to protect important data from hardware failure. Creating a mirror backup task with our software is very quick and easy. All you need to do is specify two locations, select synchronization direction, and choose how to treat files with identical names. This is done with the help of an intuitive New Task Wizard, which will guide you through all steps. 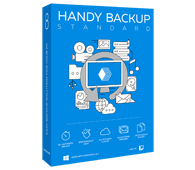 Handy Backup is an ideal mirror backup software for computer users of all levels! Try now!